Online or off, shopping for high-quality, brand-name clothes can be had for cheap if you know where to look. If you're browsing the right store, you can save as much as 90% off brand-name clothing items. Shopping in name-brand bargain hunter stores is different than shopping at traditional retailers. The shelves — whether virtual or otherwise — often have an eclectic mix of items, usually with limited stock that's gone when it's gone. Flash sales offer deep discounts on specific items for a few days or a few hours, rewarding quick shoppers who are willing to spend extra effort browsing for the perfect piece in a sea of options. Because stock can change every day, this kind of discount shopping rewards you for coming back to browse regularly — and jumping on deals as soon as you see them. If you wait for items to get deeper discounts, they may be gone. But if you want to find the best deals, you need to know where to shop. Here are six of our favorite low-cost name-brand clothing retailers. Return policy: Within 40 days, except for final sale items. You pay for return shipping, but you can also return online orders in store for free. Shopping for deals doesn't have to be a hassle. 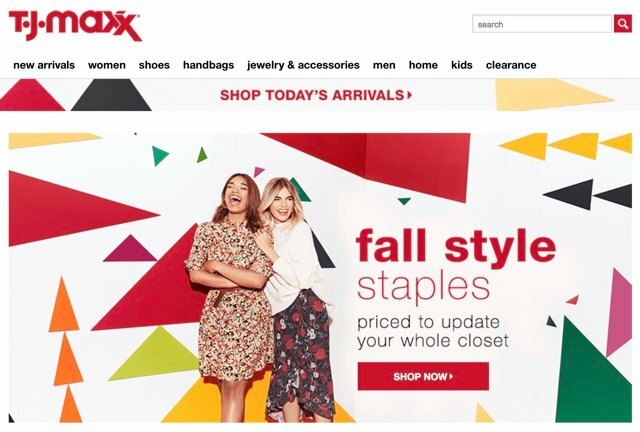 T.J. Maxx doesn't do sales, coupons or other promotions — instead, it offers prices that are 20% to 60% off every day. There's no need to wait for a sale or a coupon code, because the store offers the same good prices all the time. That's a far cry from the fashion flash sales (more on those in a minute) you'll find on other sites. The selection on offer at T.J. Maxx offers clothes for women, men and kids, as well as shoes, handbags and accessories. The collection leans towards budget-friendly, mainly offering mainstream brands with the occasional designer gem, with a Runway collection that focuses on premium design — but still at a mainstream price. Designers currently found on the site include Gucci, Fendi, Valentino, Theory, Frye and Rag & Bone. Aside from high-end fashion options, a visit to T.J. Maxx should let you kit out the whole family without breaking the bank. Return Policy: Within 30 days. You pay for return shipping. If you want to buy a new pair of Jimmy Choos and a pair of Converse Chuck Taylors in a single order, or a JanSport backpack and a Coach clutch, 6PM has you covered. While the site has the same semi-random collection you'll find at other discount retailers, there's a lot of variety on offer — and despite the brand examples above, 6PM offers clothes for women, men and kids, as well as shoes, bags and accessories. Other brands currently on site include Kate Spade, Frye, Betsey Johnson, Cole Haan, Nike, Emporio Armani and Sonia Rykiel. You can find all of your fashion needs on 6PM at a good price. Return Policy: Within 30 days, except for final sale items. You pay for return shipping, but you can get free return shipping if you're willing to get store credit instead of a refund to your credit card. 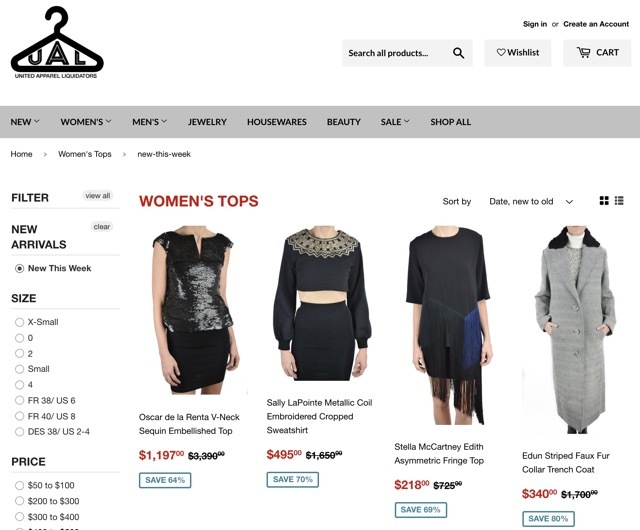 While some discount stores stock anything they can, RueLaLa offers curated boutique collections presented in flash sale style. 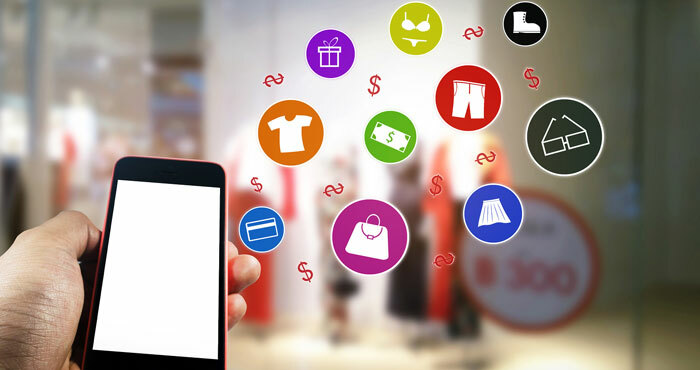 Every day new boutiques come online, each themed by a particular brand, style or fashion need, and these sales could last a few days or a few hours. On the plus side, this means fantastic deals on items that you know to offer fashion-forward quality, but on the downside, variety is limited. Still, with tons of sales available every day — and the ability to browse by clothing type instead of looking through each boutique — there's certain to be something you'll love. 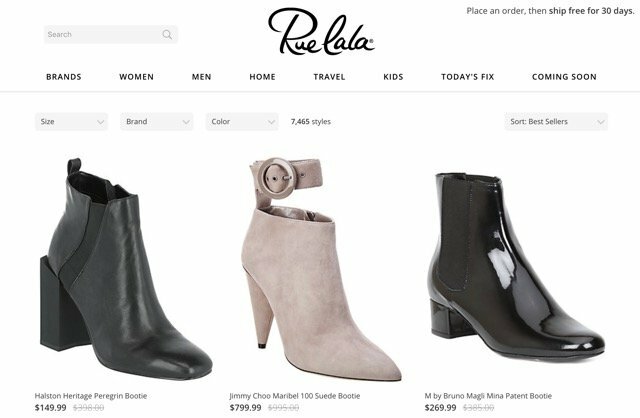 Though its boutique-style shopping makes it tough to know what will be on the site from day to day, RueLaLa has a wider range of offerings than other discount retailers. It offers collections for women, men and kids, and stocks clothes, shoes, bags and accessories but it also offers collections for home and travel, so you can shop for more than just fashion. Current designers found on the site include Ted Baker, Jimmy Choo, Obermeyer, Salvatore Ferragamo and Burberry. Return Policy: Within 30 days, except for final sale items. You pay for return shipping. You can only get store credit for exchanges. 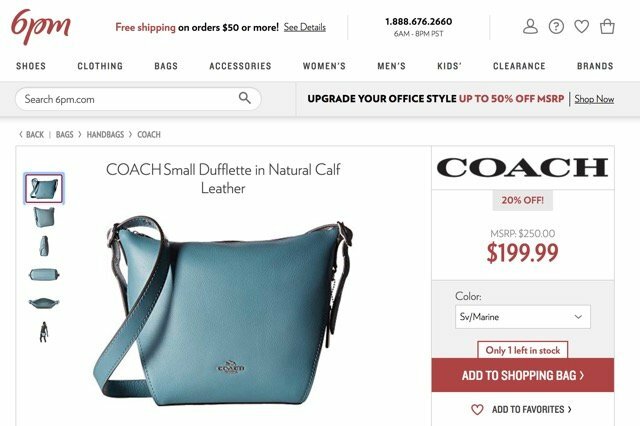 Zulily is hardly the only flash sale fashion store, but it has a definite focus on casual, everyday brands over luxury fashion. You may not find the perfect pair of Jimmy Choos here, but if you want to update your wardrobe or outfit the kids for a new school year, Zulily's selection is more practical than some of your other discount options. And in addition to the usual clothing options, Zulily also offers home goods, beauty products, baby gear and children's toys, meaning you can get a lot of household shopping done here. Every day new events — that's "sales" in Zulily terms — start at 6am, and most last three days. Designers currently found on the site include Vince Camuto, Prada, Miu Miu, Versace and Valentino. Like every flash sale site, you're more likely to catch deals by checking in regularly. 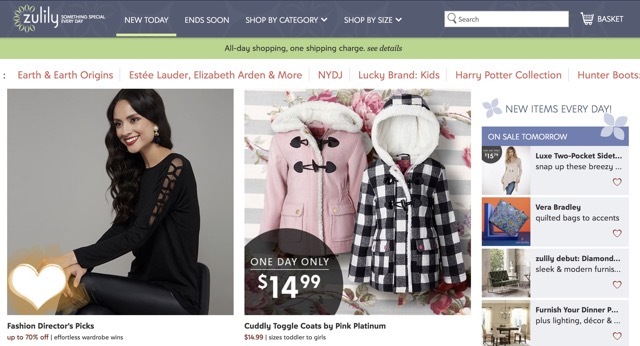 Zulily works a little differently than other retailers. Instead of keeping stock, the company takes orders on its flash sales and, once the orders are in it buys the items and ships them to you. That keeps prices low and saves you cash — the company will even consolidate orders to save you shipping fees — but means you're likely to be waiting a couple of weeks before your items arrive. Still, the low prices can make this a worthwhile tradeoff. Return Policy: Within 14 days, except for final sale items. You pay for return shipping. Some items can only be returned for store credit. If you're looking for luxury but you don't have the budget for retail prices, United Apparel Liquidators is the place to shop. Like other discount retailers, UAL buys off-season and overstock merchandise at a discount and passes the discount along to you — but unlock other retailers, UAL focuses on fashion for women and men from high-end brands. Most of us can't afford to fill our closets with Oscar de la Renta or Alexander Wang at retail prices, but UAL sells these designer brands (and more, including Miu Miu, Givenchy, Saint Laurent, Canali and Michael Kors) for 70% to 90% off. Be aware, however, that UAL's stock has almost all been on department store floors for a while before it arrived at their store. That means they most likely were handled by sales associates and customers and could show signs of wear. Check the product description for any notes on the item's condition before you buy — but even with this caveat, the deals at United Apparel Liquidators are just too good to ignore. Buying clothing used isn't for everyone, but if you're looking to save you can't get better than this kind of thrift store shopping. Swap.com aims to make buying used clothes painless by offering a collection of clothes that only meet its quality standards: everything on the site is clean, without excessive wear, free of odor or pet hair, and with working zippers and fasteners. Every item on the site will be marked based on how worn it is, from items that are new with tags to items that show some use in fair condition. By its nature as a consignment marketplace, Swap's selection is all over the map, with an ever-shifting selection of clothing for women (including maternity wear), men, kids and babies, as well as a selection of toys. Brands tend to be everyday fashion basics, like DKNY, H&M and Old Navy. These basic brands come at fantastic prices of up to 90% off. And, there are designer items to be found. On site right now is apparel by Diane von Furstenberg, Vera Wang, Marc Jacobs, Yves Saint Laurent, Christian Dior. These low prices make Swap.com a great way to refresh your wardrobe without draining your bank account. However, it can be an especially good buy for babies and children, who will quickly outgrow whatever you buy for them — no matter how much you spend on it. While you can find your favorite items at any of the stores mentioned above, there's no guarantee what will be available at any given time. And because these discount retailers have become so popular, several big-name retailers have their own stores where you can pick up off-season or overstocked apparel at low prices. The stock you'll find at these stores is all overstock from the retailers themselves, with prices cut to clear it off the shelves. Check out Neiman Marcus Last Call, Saks Off 5th, and Barneys Warehouse for clearance bargains from each. Really love the way you described shopping in these off-price stores. Spot-on! Great suggestions & UAL is my favorite! So many times I have missed buying an item because I wanted to wait for another markdown.